Open chemical waste containers are illegal. Although it is common practice for chemists and lab workers to leave open funnels on waste containers, it is out of compliance with EPA, OSHA, and certain local Fire Code regulations and may result in fines of $5,000 or more. This applies even when the waste container is under a fume hood. ECO Funnel® is designed to address these concerns and help laboratories stay compliant with local health and safety codes. Fire Marshall Steve Carroll of San Diego, California said about ECO Funnel®. "ECO Funnel is an ideal containment system that eliminates the danger of ignited vapors and spills from open chemical waste containers." An open waste container sitting under a fume hood allows chemicals to evaporate at a rate of 30-60 mL per day and does not comply with OSHA and EPA standards. ECO Funnel® screws securely onto a variety of bottles. 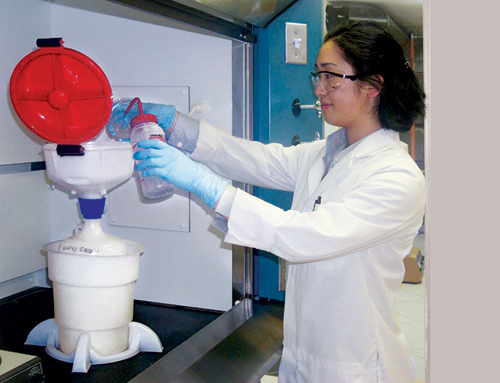 Its latching lid prevents toxic emissions and promotes a healthier laboratory environment. The gasket within the latching lid prevents nearly all chemical emissions when the funnel is not in use. Maintains a low average daily operating cost - ECO Funnel® is a cost-effective solution to waste management problems in laboratories, hospitals, and other facilities regularly working with hazardous chemical waste. Many ECO Funnels are used for several years. Your own usage may vary depending on usage. ECO Funnel® resists nearly all corrosive chemicals and can be used safely for several years. Environmental health and safety officers and industry professionals consider ECO Funnel® as a highly effective tool for chemical waste management. 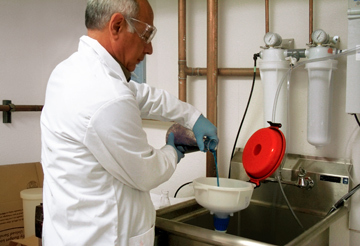 Pharmaceutical, Biotech, Academic and Government laboratories all use ECO Funnel® as part of their safety protocol. ECO Funnel is intact. Explosion in a lab did not result in fire. Typically a ductless fume hood has no ventilation to the outside and extra fumes unnecessarily overwhelm its charcoal filters. 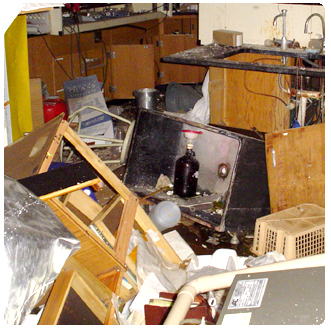 Our ECO Funnel® survived a University lab explosion completely intact and was documented in the photo to the right by a lab worker. Though the lab was mostly destroyed, the lid of the funnel remained closed, containing the volatile solvents inside and preventing a possible fire.ECO Funnel® is a powerful tool for maintaining safety in the workplace. or unless the conditions of paragraph (a)(2)(iii) of this section apply. (a) A container holding hazardous waste must always be closed during storage, except when it is necessary to add or remove waste. (b) A container holding hazardous waste must not be opened, handled, or stored in a manner which may rupture the container or cause it to leak. The owner or operator must use a container made of or lined with materials which will not react with, and are otherwise compatible with, the hazardous waste to be stored, so that the ability of the container to contain the waste is not impaired. (5) Spilled or leaked waste and accumulated precipitation must be removed from the sump or collection area in as timely a manner as is necessary to prevent overflow of the collection system. Chemists use volatile solvents such as acetone or isopropyl alcohol to wash their glassware in the sink. The Safety ECO Funnel® facilitates the collection of waste solvent, makes sink solvent disposals easier and safer, reduces the chance of spillage and contamination, and helps comply with waste solvent regulations. 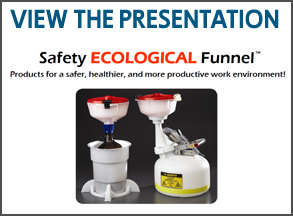 Safety Officers find that an entire lab can benefit from the Safety ECO Funnel®. A simple and cost-effective way to control emissions and reduce the fire hazard, it minimizes the exposure of lab personnel to toxic fumes, reduces odor around the lab, protects users from odorless inhalants such as dichloromethane, and prevents the chance of cross contamination during lab procedures. 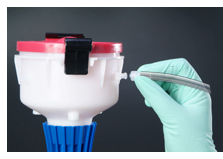 ECO Funnels™ can be equipped with one or more HPLC fittings. Located on the side of the funnel body, HPLC fittings allow the operator to connect the HPLC waste line directly to the funnel to facilitate waste collection. Make your request for HPLC adapters when ordering your ECO Funnels™ and we will custom fit them to your specifications. You can also call us a (888) 322-5722 for more information on ordering ECO Funnels™ with HPLC. ECO Funnel® can be purchased individually or as part of a complete system. 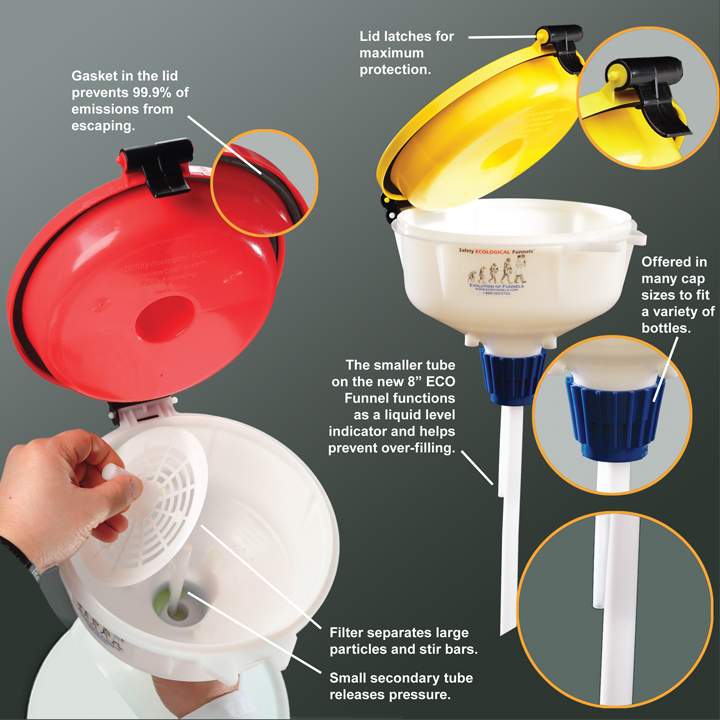 All systems include a waste collection container and 4" ECO Funnel® or 8" ECO Funnel®. Some systems also include a secondary container for extra stability and spill control. Systems that include secondary containers fulfill EPA Regulations for liquid containment. The Federal Regulation states that containers that contain free liquid must also be contained to prevent spills due to accidental breakage of the primary container.